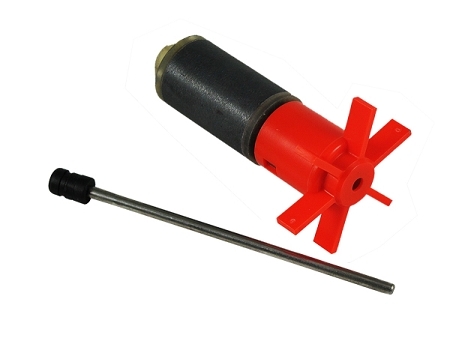 This is the original factory replacement of the rotor/impeller for the Aquarium Pharmaceuticals Filstar L (XP3). The rotor/impeller assembly includes the rotor/impeller, shaft and 1 rubber bearing. Also fits Rena Filstar XP3. The rotor is the magnet part of the motor that spins. Attached to this is the impeller which consists of blades that catch and pump the water out of the filter and back to the tank. Over time the rotor magnet loses magnetic strength and will exhibit trouble starting or the filter will have reduced flow even after cleaning. Replace the unit if your filter exhibits these symptoms or if the impeller blades break or separate from the rotor. Q: I have a Filstar xP (no number or letter) Looking to replace Impeller and can finc one for that model? Suggestions?? A: Number of baskets determines models for both the Rena and API Filstar Filters.